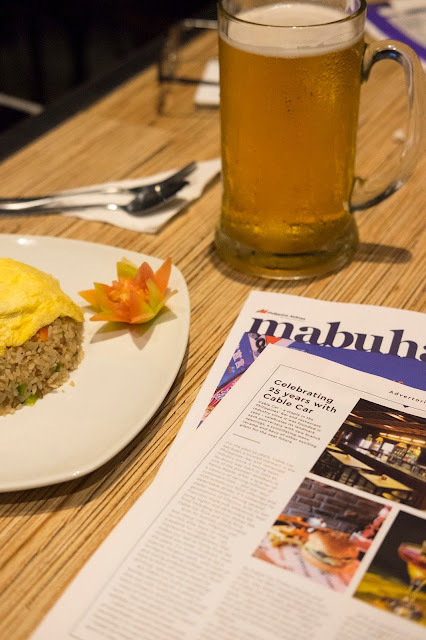 generations of Filipinos with its San Francisco-style pub ambience, beer pong nights and delectable bar food including famous dishes like Cable Car Rice and Sisig Rice. With its familiar, comfortable and casual vibe, Filipinos and toursits alike know to make a beeline for Cable Car – an impressive establishment that makes you feel at home from the moment you enter its doors. Over the years, it's continued to be a popular hangout spot, with most of its regulars being college students and young professionals who flock here to blow off some steam by drinking, relaxing and socializing. menu of hearty and flavorful dishes – many of which have a Filipino twist – that are perfect for a casual weekday or weekend dinner. branch is Cable Car Ortigas, and the very first Cable Car franchise – Cable Car Iloilo – opened in July 2016. Cable Car will also mark the opening of an exciting franchise in Pampanga this year, quickly followed by another in Alabang. This year, Cable Car is celebrating its 25th year of existence and has much in store to mark this huge milestone. These include a menu revamp to include more special dishes, branches opening 24 hours a day, a food delivery service and a Big Open Grounds Concert Event with a host of exciting activities this November. – a home away from home. Branches: Makati, BGC, Tomas Morato, Ortigas, Iloilo. CABLE CAR IS OPEN FOR FRANCHISING AND INVESTORS ARE WELCOME!